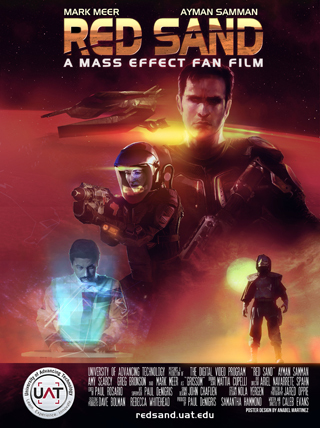 Serving as a prequel to the MASS EFFECT game series,"Red Sand" is set 35 years before the time of Commander Shepard and tells the story of the discovery of ancient ruins on Mars. Left behind by the mysterious alien race known as the Protheans, the ruins are a treasure trove of advanced technology and the powerful Element Zero, an energy source beyond humanity's wildest dreams. As the Alliance research team led by Dr. Averroes (Ayman Samman) seeks to unlock the secrets of the ruins, a band of marauders living in the deserts of Mars wants the ruins for themselves. Addicted to refined Element Zero in the form of a narcotic nicknamed "Red Sand" which gives them telekinetic "biotic" powers, these desert-dwelling terrorists will stop at nothing to control the ruins and the rich vein of Element Zero at its core. Standing between them and their goal are Colonel Jon Grissom (Mark Meer), Colonel Lily Sandhurst (Amy Searcy), and a team of Alliance soldiers tasked with defending the ruins at all costs. At stake - the future of humanity's exploration of the galaxy, and the set up for the MASS EFFECT storyline loved by millions of gamers worldwide. Mass Effect is a trademark of EA International (Studio and Publishing) Ltd. in the United States and other countries. “Red Sand” is a work of fan fiction created by the students and faculty of the University of Advancing Technology for nonprofit educational purposes, and is not intended to infringe upon EA’s copyright. No association between EA and the University of Advancing Technology is implied, nor should one be inferred.